This picturesque site is a prime attraction of Paonta Sahib, a small hill site in the charming state of Himachal Pradesh. 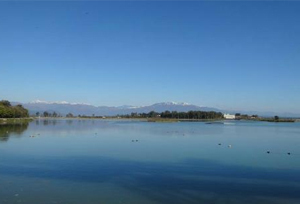 A lot of people visit this lake to have a refreshing experience and to enjoy the thrilling activities offered here. There are a few restaurants in the premises of the lake, that offer a wide array of cuisines. Tourists can plunge in their favorite delegacy at the restaurants and sit by the lakeside to enjoy the scenic beauty of Paonta Sahib. Highlights The Assan Lake is located at a distance of 4 km from Paonta Sahib and is maintained and developed by the Himachal Pradesh Tourism Department. It is one of the most popular destinations in Paonta Sahib and offers recreational facilities like speed boating, rowing, paddling, and sail boating. The visitors can also take up adventure sports like water skiing and hovercraft rides to satiate the adventure junkie in them. This beautiful lake is surrounded by lovely trees and look pretty in the evening when the last few rays of the sun fall on the surface of scintillating lake just before the sunset. This is a definite place for photographers, who loves to capture the exquisite beauty of nature and make the visit a memorable one.